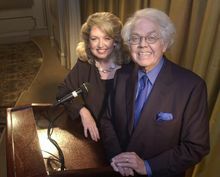 LOS ANGELES (AP) — Stan Freberg, the spirited comic genius who lampooned American history in his landmark recordings "The United States of America" and was hailed as the father of the funny commercial, died Tuesday. He was 88. Freberg died at Santa Monica UCLA Medical Center, his wife, Hunter Freberg, told The Associated Press. His face might not have been as recognizable as other humorists', but Freberg's influence was arguably greater, thanks to a huge body of work assembled over 70 years that encompassed radio, television, comedy albums, advertising jingles and nightclub performances. "He's an American institution," film historian Leonard Maltin once said. "His name has become embedded in our culture like Mark Twain's." Freberg continued to work almost until his death. In November, he took in "The Genius of Stan Freberg," a retrospective hosted by "The Simpson's" Harry Shearer and attended by "Weird Al" Yankovic, the Monkees' Micky Dolenz and others. In recent years he was a panelist at the Comic Con pop-culture convention, and in 2011 he released a new comedy recording, "Songs in the Key of Freberg." Over the years, he provided the voices for numerous cartoon characters for such films as "Lady and the Tramp," ''Alice in Wonderland" and "Stuart Little." He did them for popular TV programs as well, including "The Bugs Bunny Show," ''Ren & Stimpy" and "Freakazoid." He also occasionally appeared in front of the camera, including a recurring role on the 1990s sitcom "Roseanne." But he had his greatest impact through comic records and syndicated radio shows that began in the 1950s and continued into recent years. His masterpiece was the pioneering concept album "Stan Freberg Presents The United States of America," a work produced in two volumes that sounded seamless although they were recorded 35 years apart. They took the listener from the time of Columbus' arrival in North America (he couldn't pay for the land he'd just discovered because it was Columbus Day and the banks were closed) up to the time of World War I. The album, a favorite of generations of schoolteachers, imparted key dates and events in the nation's history through a series of Broadway-styled, song-and-dance numbers. In one, a nervous Ben Franklin balks at signing the Declaration of Independence, fearing if he does, he'll be called before a committee investigating radicals. At one point, Franklin notes that George Washington didn't sign. "That's George for you," Franklin notes. "Talks up a storm with them wooden teeth. Can't shut him off. When it comes time to put the name on the old parchment-a-roonie, try and find him." In recent years, Freberg was working on Vol. III. He told the AP one of the bits he finished featured Gen. Douglas MacArthur, while retreating from the Philippines during World War II, trying out the line, "See ya later, alligator" before settling on "I Shall Return." After much success lampooning American pop culture, Freberg began to turn his attention in the late 1950s to advertising. He quickly found the same kind of success that brought him a Grammy for 1961's "The United States of America Vol. 1" and three Emmys for his work on the pioneering 1950s children's TV show "It's Time for Beany." He won nearly two dozen CLIO awards, advertising's equivalent of the Oscar, leading the industry publication Advertising Age to declare, "No one label fits Stan Freberg. But the father of the funny commercial seems a fitting epithet." Indeed, Freberg commercials were never just ads but entire comedy shows. One 1958 radio commercial titled "Omaha" was an elaborate, eight-minute musical production. The ad was for Butternut Coffee, but the product wasn't even mentioned until the very end. Instead, radio listeners heard what sounded like a Broadway musical relating the story of a young man kidnapped by gypsies who returns to his fun-loving hometown of Omaha, Nebraska, (where it turned out Butternut Coffee was based), intent on ruining the lives of everyone. For many of his TV commercials, Freberg persuaded celebrities to lampoon themselves. In one for prunes, he had science-fiction author Ray Bradbury come on camera to deny he had ever predicted in his futuristic novels that one day everyone would be eating the product Freberg was pitching. In another, he had television's original Lone Ranger, Clayton Moore, show up in costume to complain that a Freberg commercial for pizza rolls was using his theme song, "The William Tell Overture." "Man, I had a terrible time talking Clayton Moore into doing that," he recalled. Although some fans groused that such silly ads were taking time from his art, Freberg was nonplused. The son of a Baptist minister, Stanley Victor Freberg was born Aug. 7, 1926, and raised in the Los Angeles suburb of South Pasadena. He planned to attend Stanford University on a speech scholarship, but the summer before he was to enroll, he decided to visit Hollywood on a lark to see if he might have a chance in show business. He recalled taking a bus to Hollywood Boulevard and walking into the first office building he saw, one housing a talent agency called Stars of Tomorrow. On the strength of his impressions of famous people, and his distinctive booming voice, the agency sent him to Warner Bros.' cartoon division, where he was hired the next day. 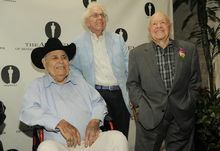 Freberg eventually was inducted into the Radio Hall of Fame, the Songwriters Hall of Fame and the Animation Hall of Fame. In addition to his wife, he is survived by a son, Donavan, and a daughter, Donna Jean. I will never forget Stan. Stans humor will be forever remembered. I enjoyed hearing him on radio and my grand dad talking about him. Hw will be missed! R.I.P. No question about it...a genuine 14 carat dyed in the wool American Original. him, his family,his fans,and for the future of unfettered satire. When I was growing up in the 1960's, I didn't know who Stan was, but I certainly knew him through his cartoon work and advertising....I remember running to my mom, just thrilled that one of my favorite authors of SF (Ray Bradbury) had done a prune commercial (?! )- When I was older and was introduced to Stan through his recordings in the 1950's on Capitol records (I collected vinyl at an early age and still do)- I found a kindred spirit....when I went for my Masters at Concordia University in Chicago (1997)- I listened to his weekly radio program and was entranced- and his sense of humor always endured and shone through. Brilliant does not begin to describe Mr. Freberg. From Pete Puma to The Banana Boat Song the The History of the United States of America, he has put an indelible mark on American entertainment. Heaven has a true genius.